Yes, you too can turn pens if you follow these 28 easy steps! We'll show you how to go from a 3/4in x 3/4in x 5in "blank" to the pen you see here. The wood used in this example is Tulip Wood which is very dense. These blanks are available at Woodcraft or Penn State Industries. The wood has a bit of oiliness to it and polishes up quite nicely. The pen style pictured here is known as a "European Style" pen. This is twist-style pen, a little fatter than most, and easily identified by the collar at the bottom of the upper half of the pen. 1. 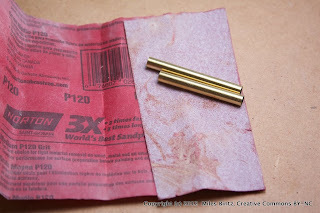 Remove the brass tubes that came with your euro-style pen kit. Notice that one tube is about 1/4" longer than the other. 2. 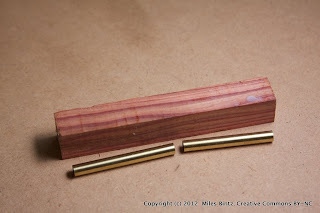 Transfer the length of the tubes to your pen blank. 3. 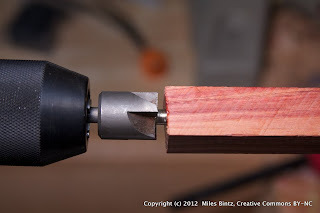 Use your favorite cutting tool to saw the blank in half. I zip these through a band saw without the use of any aides. It doesn't have to be perfectly square. We'll address that later. 4. 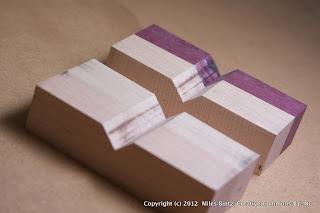 With the blank cut in half we must now drill a 7mm hole down the center of each blank. A little error goes a long way here. 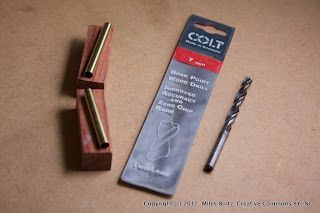 It is important that the blank halves are parallel to the drill bit when drilling. If the blank is drilled at angle then you'll be fighting against the eccentricity and vibration as the blank spins. In the worst case you may not leave yourself enough material to keep the wall-thickness and profile you want. To help keep things straight we grabbed some scrap and cut a 90 degree groove down the middle. This will become a jig for our drill-press. 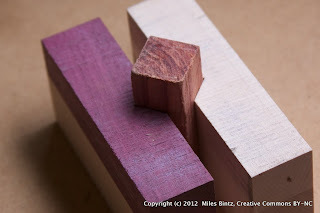 The scrap blocks clamp the blank by its outer edges rather than the faces of the blank. 7. 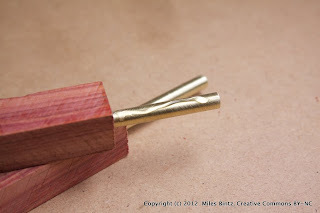 We carefully (but quickly) align the center of the drill bit with the blank. I've installed a milling vise on my drill press to help with this. 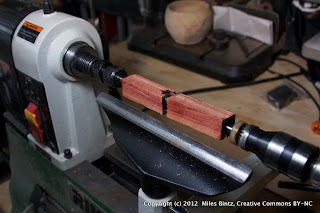 Between the jig and the milling vise we have a decent centering-like vise. 8. 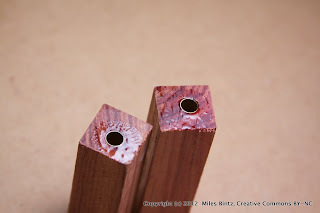 After drilling we should have two mostly-centered holes in our blanks. It's important to clear the wood chips from the bit while drilling and choose a bit speed which is appropriate for the material you're working with. I typically use a bit speed between 1200 and 1800 RPM. If your bit speed is too high the friction may generate enough heat to make the wood crack. If the bit speed is too slow it may blow out the bottom of the cut, especially on synthetic materials like acrylic. 9. 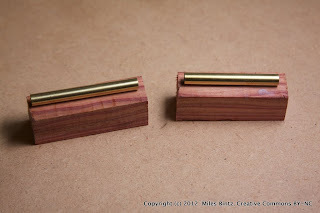 Once the holes are dilled the brass tubes can be glued in. 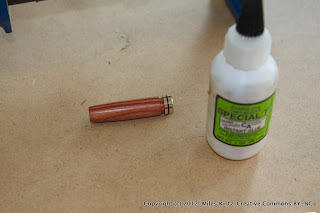 Before gluing it helps to rough the tube with coarse sand paper so that the glue has some mechanical holding power. Any paper between 60 and 120 grit will suffice. You can see the scratch marks on the surface of the brass tube in this picture. 10. 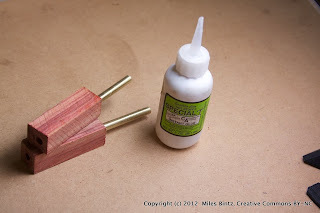 Lay down a bead of thick CA glue. Depending on the run-out (wobble) of your drill bit, your hole may be a little larger than 7mm. For this pen the fit is tight enough so that gravity won't over-come friction. 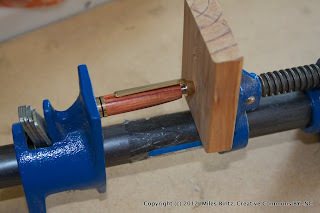 It should be loose enough to insert and twist the brass tube in the blank with relative ease. If it's too tight the glue will set very quickly and/or you'll ruin the brass tube (and most likely the blank) while trying to force it in. 11. 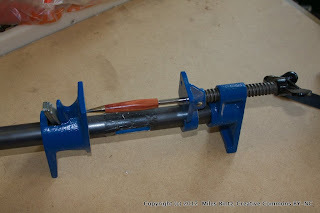 As you slide the tube in, twist it round and round to distribute the glue. Don't dilly dally or the glue will set on you and you'll ruin your blank. 12. 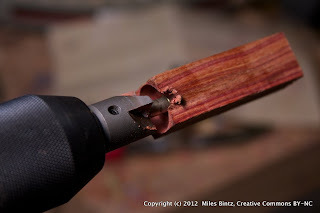 After the glue sets we load a Pen Mill into our chuck. 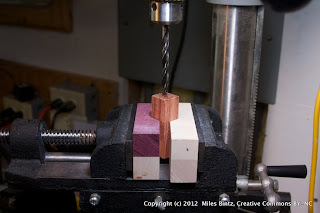 You can do this at either the drill press or the lathe. 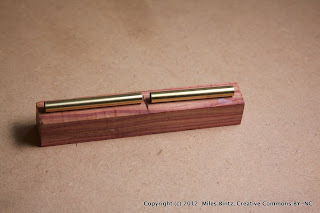 The job of the pen mill so to make the end of the blank perfectly square to the tube. If we don't do this then the nib (tip of the pen), the collar, and the cap may not sit flush against the blank. 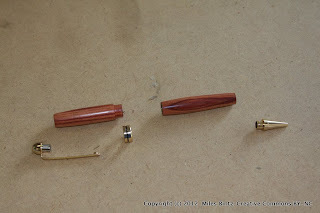 We drill down with the pen mill until we're flush with the end of the brass tube. Here you can sight down the cavity the pen milll left. 13. 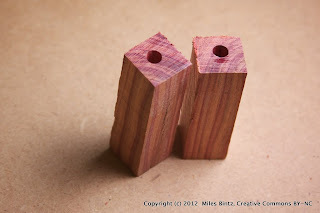 The ends of the blanks are milled square we place a pen mandrel on the drive end of the lathe. 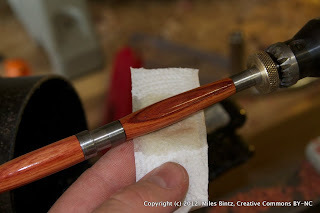 A mandrel is basically a steel rod that adds stiffness to the pen blanks while turning them. It also lets us turn both blanks at once. 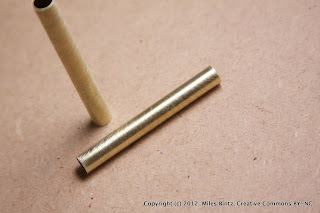 The brass tubes on a euro-style pen are a perfect fit around the mandrel. The bushings you see are placed at each end and in the middle of the pen. 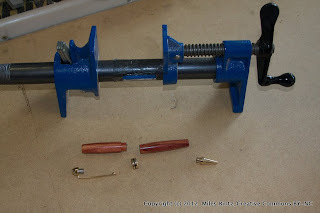 The bushings not only space the pieces out so we have room to work, but they also show us the final diameter we need to achieve so the pen parts sit flush with the blank. 14. 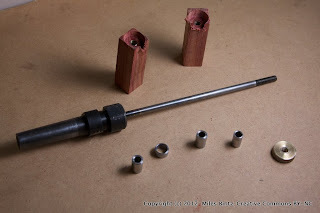 Assemble the blanks on the mandrel. Some care must be taken here because the pen top is shorter than the pen bottom. The clip, collar, and nib are show in their respective locations so you can visualize where things are heading. 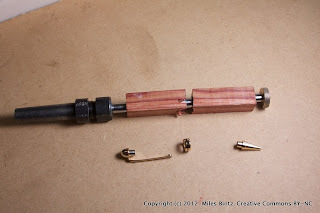 Typically you'll assemble the mandrel when it's already on the lathe. 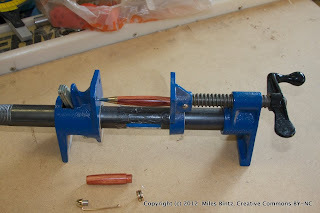 Here is a picture of the assembled mandrel ready to go. 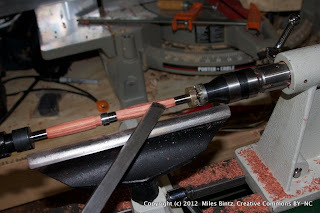 The end of the mandrel is conical and concaved so it rides on the tail center. Care must be taken to not apply too much pressure with the tail center or else you can bow the shaft and induce vibration problems. 15. Grab your safety glasses and favorite wood-cutting tool and turn the blank down to your desired shape. If you have a vibration problem it'll manifest as a hideous screeching noise while you turn. The screech is caused by the chatter of the tool surface against the pen material (or any spindle work) vibrates. Care must be taken to remedy the cause of chatter quickly (loosen the tail-stock, support it with your fingers, etc). If you cut the out-of-round shape into the blank when the material is vibrating then correcting the root cause of the vibration may not be enough to stop the chatter moving forward. The irregularities will continue to induce chatter and will plague you for the rest of the project. 16. After you have achieved the shape you want we sand. Here we're using 220 then 320 grit. No, it's not time for a ham sandwich. 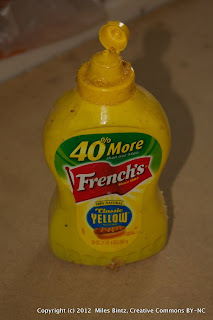 My French's Mustard bottle is filled with Boiled Linseed Oil. 18. Apply some finishing oil to a paper towel. 19. Slow the lathe way down and rub it into the wood. As the fresh oil glistens on the blank you get a preview of what the finished product will look like. 20. 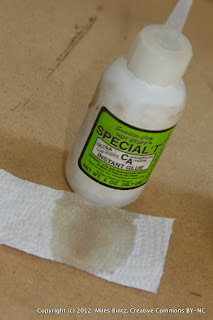 Using the same paper towel add a pea-sized drop of CA glue to the oil and work the CA glue into the wood just like you did with the oil. You'll see the glue go from glossy wet to a matte finish and back to glossy as it sets. 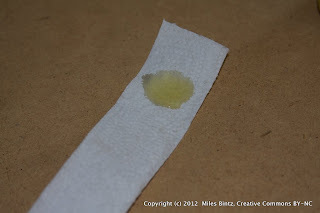 Keep the paper towel moving and keep working the oil into the glue. You'll repeat this process 3 to 5 times. This has to be the most counter-intuitive parts of the project. You would think that applying glue to a paper towel and touching it to wood would be a good way to glue the paper towel to the pen. In fact, the oil catalyzes the curing of the glue. As long as there's oil between your finger, the paper towel, and the pen the glue will apply very evenly to the surface. 21. 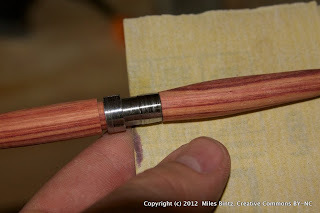 After finishing the pen with glue I like to add some beeswax. 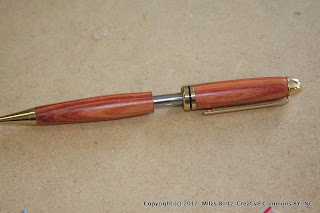 The boiled linseed oil and the beeswax give the pen a very soft, smooth feel. 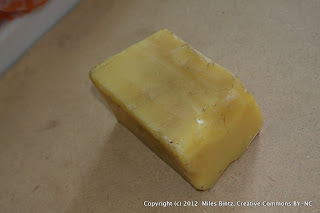 You can smell the clover in my beeswax so it adds a nice odor to the finished pen as well. 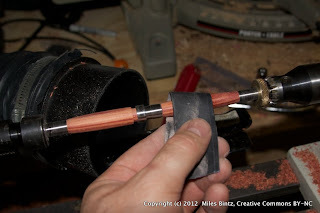 I use a small pipe clamp instead of a pen vise. 23. Start by gluing the collar on. Be very careful here. 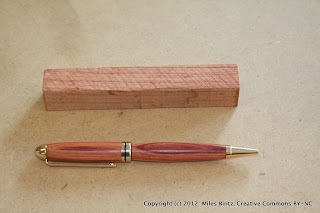 The CA glue can squeeze out and ruin the finish of the pen. 24. 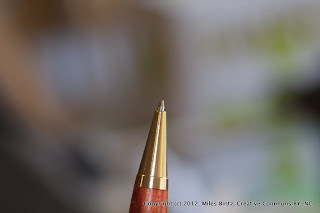 While the collar dries we press in the nib. 25. Pres in the twist mechanism. Be careful to keep everything aligned or you can bend the mechanism or split the pen. 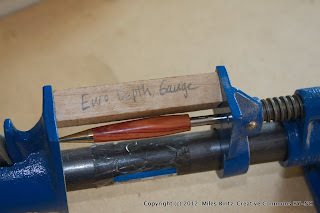 It helps to have a gauge to set the depth of the twist mechanism. If you go to far then the pen cartridge won't retract enough. This is fixable with a few tools but it will cost you time. 26. Inspect the depth of the pen cartridge. It's spot on. 27. Press in the clip. 28. Final assembly. Be sure to line up the grain. The pen top and pen bottom are friction fits and can be disassembled to replace the cartridge.